Anyone who witnessed Salford’s early season displays would find it difficult to believe that the Reds were fighting for their Super League life at the season’s end. The six points deduction for the salary cap breach and recent loss of form left Salford staring at the abyss. Coach Ian Watson was able to welcome back Craig Kopczak from injury to offset the loss of Adam Walne through suspension. The Reds were looking for a good start to get a foothold in the game but instead found themselves behind when prop-forward Adam Walker dived in for a close-range try. Josh Mantellato added the easy conversion for 6-0 lead after seven minutes. Salford then suffered a setback in the 9th minute through the loss of Junior Sau with a rib injury. He was replaced by Niall Evalds. Things then went worse for the Reds when Mantellato crashed over in the corner for a 10-0 advantage after just thirteen minutes. Salford though came storming back mid-way through the half when Ben Murdoch –Masila thundered through to score to give their fans some hope. Gareth O’Brien’s conversion attempt was a bit of a flapper to leave the Reds trailing at 10-4. Salford continued to plug away at the Rovers defence and drew level in the 32nd minute when clever play created an overlap for O’Brien to send Evalds racing in to score. O’Brien converted (10-10). With half-time approaching ,Josh Griffin gave away a penalty for holding down. Mantellato made no mistake (12-10). Whilst 10-10 would have been a better interval score,most Reds fans were happy with 12-10 especially as the Reds had clawed their way back into the game after 10-0 deficit. The Reds applied some early pressure after the break but failed to breakdown the keen Rovers defence. In the 56th minute,a kick by Graeme Horne was pounced on by Thomas Minns and with Mantellato adding an excellent conversion the Rovers were looking comfortable at 18-10. The Reds had had no clear-cut chances but errors had begun to creep in and you sensed the game was drifting away and life in the Championship was beckoning. Salford fans had begun to make for the exits as the clock showed just two minutes remaining. Those two minutes though were absolutely stunning as firstly Evalds scooted in at the corner on the left wing before Greg Johnson scampered over on the right wing to send Salford fans into raptures. O’Brien was unable to convert either try but then showed remarkable composure to slot home a golden point drop-goal from fifty yards to steal a truly astonishing victory to maintain the Reds place in Super League. Anyone who was at this game will never forget what was an unbelievable experience to bring down the curtain on the Reds controversial 2016 season. 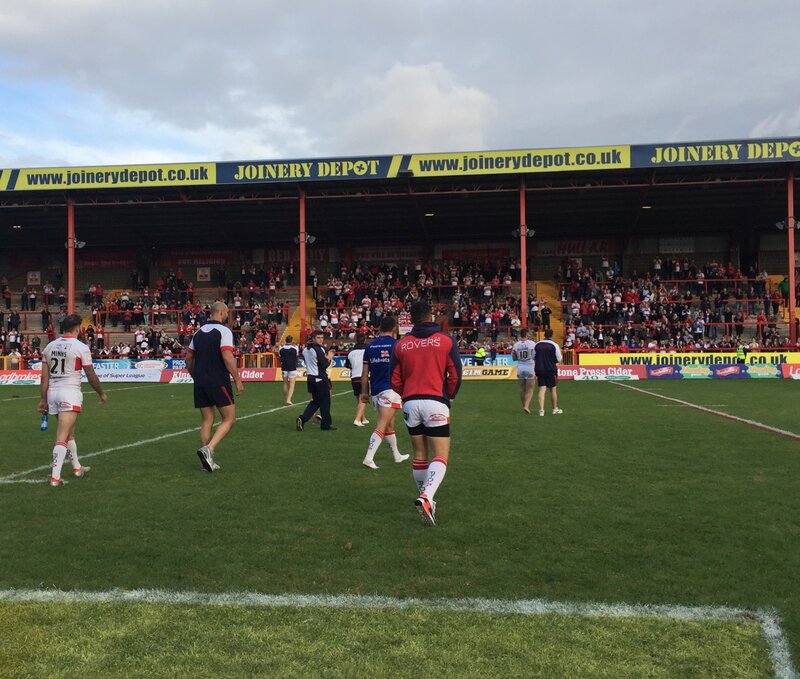 Ian Watson said later: “There’s a big sense of relief because we felt harshly done to by losing six points. I feel for Hull KR and what they are going to go through in the next couple of weeks. “I’ve seen last-minute drop goals before but never one like that,it was a massive play by Gaz O’Brien to be fair. One major blot on the occasion was the punch-up between fans on the pitch after the game which is bound to have repercussions for both clubs. Salford: O’Brien, Johnson, Jones, J Griffin, S’au, Lui, Dobson, Burgess, Tomkins, G Griffin, Murdoch-Masila, Hauraki, Flanagan. Subs: Kopczak, Krasniqi, Evalds, Kenny.